Another tiebreak match of the 1/8 finals was deciding who of two Russian GMs would stay in Baku and who would start packing his luggage - Sergey Karjakin or Dmitry Andreikin. Alexander Bakh to Dmitry Andreikin: "Castling with both hands? Not recommended..."
"I have such a bad score against Andreikin in rapid and blitz as well as in classical games that I took the tiebreak pretty calmly, - the winner told Chess-News after everything had been over. - Although seriously speaking, I think I am not bad in rapid so it wasn't my ultimate goal to defeat him in classical games. He didn't play for a win in the first classical clash, and I tried to push a little in the return game but he played very accurately. Thus, the equal score was logical." After taking 43.Ng4xe5 I already saw I had Qh8+. At this moment I became quiet as a mouse and humbler than the dust. I hoped he would blunder and that happened. Listen to Karjakin's full commentary (in Russian) in the audio player. "I take this competition pretty philosophically, - Karjakin confesses. - I could lose against Onischuk. 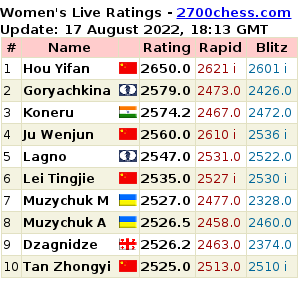 The match against the Chinese player went well but you can't always win in the classical games. Regarding the today's match, I thought if it was written I would be eliminated. I fought till the end and I am happy to advance to the next round." Karjakin's rival in the quarterfinal is Shakhriyar Mamedyarov. Submitted by Mark Watkins on 23 September, 2015 - 04:34. Qh8+ must be known to every Russian schoolboy from Game 10 of Petrosian-Spassky 1966. Lesser known is that Petrosian had a similar Qh8+ shot against Simagin in the 1956 Soviet champ. GM Sergey Karjakin is one of the heroes of the second round of the FIDE World Cup. After losing his first classical game against Alexander Onischuk, Russian GM managed to take a revenge in the return game. Today he beat Onischuk on the tiebreak. Sergey Karjakin: "I Dedicate My Victory To Vugar Gashimov"
Another playoff full of drama took place in Andreikin - Dreev match. 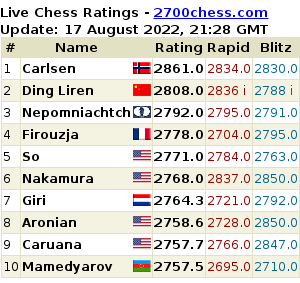 Both GMs are very well known masters in rapid chess. In the Fifth Circle. GM Eljanov: "It's Already a Good Result, But I'll Try to Go As Far As Possible"
Pavel Eljanov evaluates his completed match against Dmitry Jakovenko as equal. However, he took the upper hand over his Russian rival in the tiebreak. Giri: "I Didn't Behave Myself During the Tiebreak..."
"Then I got warned by the arbiter, pulled myself together and won"